Where: On the worktop to ripen, ideally on a banana hanger to prevent bruises. Once ripe, they can go into the fridge-the skin will get browner but the flesh won’t be affected. Why: Refrigerating unripe bananas stops the ripening process for good, even when they’re back to room temperature. Tip : Don’t keep bananas with other fruit, unless you want to ripen it – bananas give off ethylene, which helps fruit to ripen. Where: In the salad drawer of your fridge in a sealed plastic bag. Why: The salad drawer isn’t as cold as the rest of the fridge – important because leafy herbs can black at temperature below 3 degree C.
Tip : For big bunches of herbs with stalks, such as basil or parsley, snip the ends, place upright in a cover glass filled with 1 in of water; cover with a plastic bag and secure wiith an elastic band. they’ll keep for five days like this. Where: Once opened, in the fridge to be used within around six weeks. Why: Oxygen and warmth are needed for yeast and moulds to mutliply. Once opened, preserves come into contact with oxygen. Keeping them cool in the fridge means growth of moulds is hindered. Tip : Low-sugar or no-added-sugar jams have a shorter shelf life because they lack the full preserving effects of sugar. Once a jam or marmalade develops mould or yeast, the whole jar should be thrown away. Mould can produce mycotoxins that can make you unwell, while yeast indicates fermentation, which affect the flavour. Where: Store in their box in the fridge. Why: To stay safe and fresh, eggs need to be kept at a constant temperature below 20 degree C. Most kitchens fluctuate in temperature, often getting hotter than this, so it’s best to keep eggs in the stable, cool temperature of the fridge. Tips: Bring eggs to room temperature before using them, for better cooking results. Where: In a cool room away from sunlight and stored horizontally – 10 degree C-18 degree C is perfect for storing red wine, while white wines should be stored at 7degree C-10 degree C.
Why: temperature fluctuations can damage the wine and cork. High temperatures cause wine to age, while cold affects the flavour. Storing it horizontally means the cork stays moist, meaning it’s less likely to crack. Tip: freeze leftover wine in ice-cube trays then add to stews, casseroles and gravy. Where: In a bread bin or paper bag on your worktop. Why: Refrigerated bread goes stale four times more quickly than bread kept at room temperature – cold temperatures start a reaction that forces water out of the starch molecules, causing the bread to become firmer and stale. Tip: Plastic bag keep bread softer for longer but they hold in moisture, which can cause mould. Where: On your worktop. Once ripe, store in a cool place away from direct sunlight-but not the fridge. 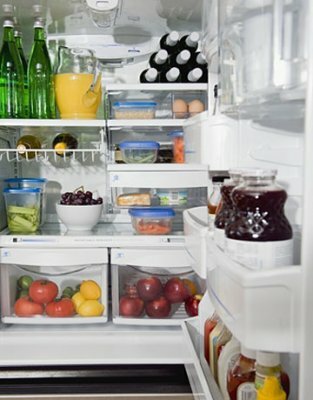 Why: Refrigerating tomatoes damages the cells, reducing their flavour. Tip: Tomatoes produce ethylene so will ripen other fruits quickly if stored together. Where: There’s no need to keep them in the fridge-in a fruit bowl away from sunlight is fine. Why: A study has shown that cold temperatures reduce the concentration of antioxidants called polyphenols in the skin of apples. Tip: remove bruised apples-they’ll quickly damage the rest. Apples produce ethylene so can help ripen other fruit and veg. Where: In the fridge. Remove from carton, ditch any mouldy or squashed berries and place in a single layer on a plate lined with a paper towel. Cover and refrigerate. Why: Berries quickly deteriorate at room temperature. The paper towel absorbs moisture from the berries, which contain 85-90 per cent water! Tip: Don’t wash berries untill you’re ready to eat them or they’ll become mushy. Where: In the main compartment of your fridge in a paper bag. 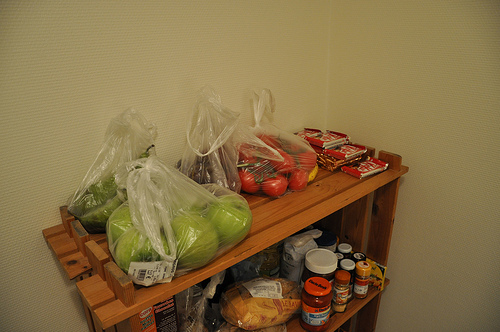 Why: The salad drawer contains more moiture than the main part of the fridge – and that’s not good for mushrooms. Paper bags are better than plastic ones because they absorb excess moisture from mushrooms, helping to prevent them becoming slimy. Tip: Mushrooms absorb strong odours, so keep them separate from powerful-smelling ingredients. Where: Remove from plastic bags and keep in a cool, dry, dark place – a kitchen cupboard is ideal. Why: Daylight can make potatoes turn green. Cold temperatures encourage the conversion of starch into sugar so refrigeration can mae potatoes taste sweet. Tip: Potatoes absorb strong smell from foods such as onions or gralic so keep separately. Where: On the worktop at room temperature to ripen, then in the fridge once ripe. Why: Refrigeration destroys the ripening process. Tip: To ripen quickly, pop an avocado in a paper bag with an apple, banana or some tomatoes. The ethylene from these other fruits will get trapped in the bag and trigger the ripening process. Where: Away from the oven and kitchen window – ideally in a dark, cool cupboard. Why: Excessive heat, air and light cause the oil to turn rancid. You don’t want it to be too cold either though-storing extra-virgin olive oil in the fridge may cause condensation, affecting its flavour. Tip: Keep oive oil in a dark tinted glass bottle or ceramic container to protect it from light.